There has been a lot of confusion regarding AB1308, the legislation that went through at the beginning of this year in the state of California. It said that LMs were no longer allowed to attend home births in some situations (such as breech, beyond 42 weeks gestation, etc) and other situations required a physician to sign off on the home birth. It’s these regulations that are currently being written by the Medical Board with input from ACOG, CAM, CFAM, and VBAC Facts. 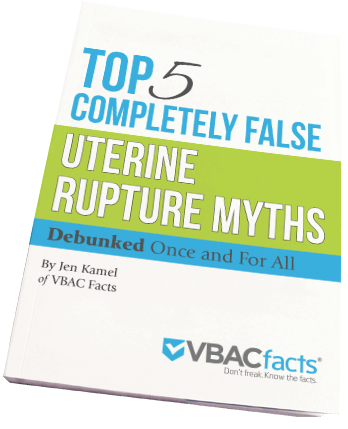 It is under discussion whether a prior cesarean should be included on this list of conditions that would necessitate a physician’s approval in order for the woman to plan a home VBAC. On October 15, 2014, I flew to Sacramento and attended an Interested Parties Meeting at the California Medical Board. I spoke on behalf of California women who want home VBAC to remain an option in our state. You can read a summary of that meeting here and listen to a partial recording of the meeting here. VBAC would be my option for my second birth. My first was emergency c section due to how I was induced. I was not happy. I would hate to have my choice taken from me for the hospitals screw up on my first birth which was supposed to be natural. Home VBAC is important to me because it is important to my clients. As a Labor Doula, I serve women at both the hospital, birth centers, and at home. I have served both hospital and home VBAC clients, and the outcomes of my home VBAC clients have been phenomenal. Midwives know when to transfer, and are vey skilled at what they do. This is a decision that women should be able to make, not for someone to make for them. Please keep this right to choose where to birth up to the mother, with the skilled advice of the care provider of their choice. Women should have the chance to choose their providers with informed choice. Truly VBAC supportive providers can be incredibly difficult to find and midwives generally are supportive and have high vbac statistics. I thank my midwives for their support for my home vbacs! Thanks Jen for sharing the information and for those of you who haven’t check out California Families for Access to Midwives! 1. 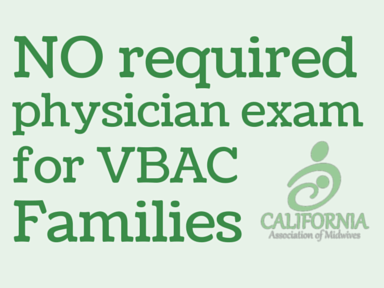 Why home VBAC is important to you: I live in CA and I have had 2 cesareans and 3 VBACs, the last one at home because there were a very limited number of providers in my area would provide a VBAC even though I had already 2 previous successful vaginal births. I am now a Licensed Midwife who very much supports and educated decision on the risks and benefits of VBAC either in the home or the hospital. I have an attempted HBAC in 2013. Although, I was a hospital transfer, I firming believe that had I not been in a midwife’s care throughout my pregnancy and labor (52 hours! ), I would have had the decision made for me. Baby and mama were fine! Home VBAC is important to me because I had one! There are wide variations of normal for the birthing process. I tend to have very long labors and a lot of pushing time. My VBAC (accompanied by a midwife, student midwife, and 3 doulas) was a 26 hour labor with 9 hours of pushing. NINE hours! There’s not a hospital in this country who would let me labor like that without a major fight. Baby was perfectly fine, and checked regularly with intermittent fetal monitoring. Absolutely no complications! I felt happier and recovered quicker after my VBAC. That was very important to me since I have 3 older children and a husband who is away in the military. I needed to be able to care for my older children asap.